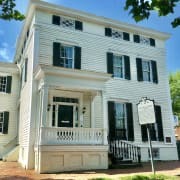 The Lee-Fendall House is seeking volunteer museum educators to assist in leading educational programs for students and families. Examples of these programs include school field trips, preschool story times, and homeschool days. Availability during weekdays is essential. Leading educational activities and tours for students and families. Developing knowledge of program materials, the site's history, and the museum's collection in order to engage with students and answer their questions. Researching and developing new program topics and activities. Assisting with program preparation (printing handouts, preparing craft supplies, etc.). Ensuring the safety and securty of the museum and its collection during educational tours and programs. Attending ongoing training led my museum staff. Training new volunteers in presenting program material. Distributing museum brochures, posters, and other marketing materials to schools, clubs, libraries, and other appropriate groups. Knowledge of American & Virginia history is required, a degree in a related field is preferred. Prior experience working with children, especially in a school or museum setting is also required. Availability is most needed on weekdays although occasionally programs are held on Saturdays. Volunteers will be expected to work a minimum of 6 hours a month, which may consist of half-day shifts (3 hours) or full-day shifts (6 hours). Regular commitment is desired and volunteers are encouraged to provide more than the required minimum hours. Availability is most needed on weekdays, although programs are occassionaly held on Saturdays. Three days of training must be completed within the first month of training. Training and guidance will be provided by museum staff. A handbook, which includes program materials, is provided on the first day of training.